Transport operators yesterday slammed unscrupulous drivers and conductors for taking advantage of a review of fuel prices by the Government on Saturday to charge commuters extortionate fares. The Government also immediately undertook to neutralise the ripple eff ects of the fuel price increase on general goods by extending tax rebates to all registered businesses in key sectors of the economy, including transport. Government increased the price of petrol to $3.31 per litre while diesel is now $3.11 per litre. Commuter omnibuses are now charging from $3 to $10 on some urban routes, up from $1 and $2. 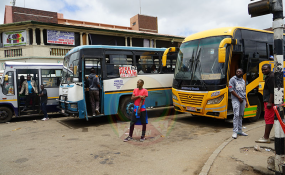 Greater Harare Association of Commuter Operators (GHACCO) secretary general Mr Ngoni Katsvairo yesterday said operations on the ground were controlled by touts. "These fares just happen without us setting them. It's a result of individualism. Most of the fares cannot be justified. We have been saying commuter omnibus operators should join associations so that it will be easy to manage them," he said. Government needs to engage operators on the issue of rebates as they did not know how to claim them, hence they cannot operate expecting rebates whose modalities are still to be worked out. He suggested that Government could introduce dedicated fuel service stations for public transporters. Urban Transport Association of Zimbabwe (UTAZ)'s Mr Felix Mpofu called for dialogue between Government and operators. "The exorbitant fares are being charged by unscrupulous drivers and conductors who are taking advantage of the prevailing situation to swindle passengers. We condemn people who are charging such fares," he said. "We support Government in its endeavours. We will not support people who want to charge passengers $3 for a small distance. It is tantamount to making every passenger buy a litre of fuel. It is not making sense." Announcing the rebate on Saturday where the new fuel prices were revealed, President Mnangagwa said; "Cognisant of the need to prevent generalised price increases for goods and services in the country, with the attendant hardships which that will entail especially to the commuting workforce, Government decided to grant a rebate to all registered business entities in manufacturing, mining, commerce, agriculture and transport sectors." Exact details of the rebate system will be announced in due course.